The outside chapter for the time dial has black Roman numerals for the hours, the fast/slow arbor above the twelve, nicely finished steel Breguet-style hands and a matching sweep seconds bit. The sunken center carries the outside escapement, a lunar aperture and the retailer’s signature, ‘JW Benson, London’. Below are the white porcelain subsidiary dials with black lettering, gold accent marks and steel indicator hands. They include sunrise, sunset, day, date and month. Centered is the polychrome porcelain equation of time dial with a steel-cut indicator hand that carries a gilt-bronze sun. and a sector aperture that shows the polychrome dial with the twelve zodiac symbols each framed by elaborate gilt-work. Framing the wonderful dials is an elaborate gilt-bronze mask with engraved scrolling foliage against a chased ground. 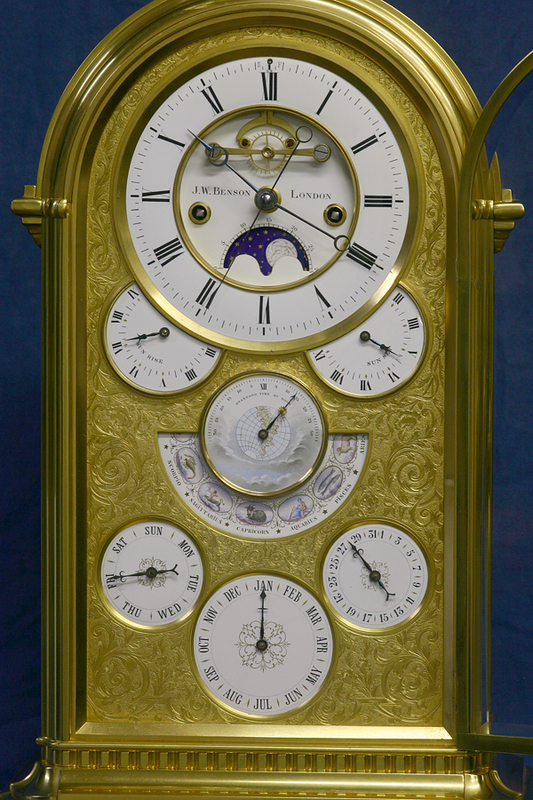 The eight-day time and strike movement has shaped plates, an outside escapement with jeweled pallets, a sweep seconds hand, a Brocot suspension, an adjustable crutch, is stamped ‘AB’ in a star and ‘1325’ and ’24 8′ on the backplate, a glazed compensating pendulum and strikes on a large coiled gong mounted to a wooden board in the base. 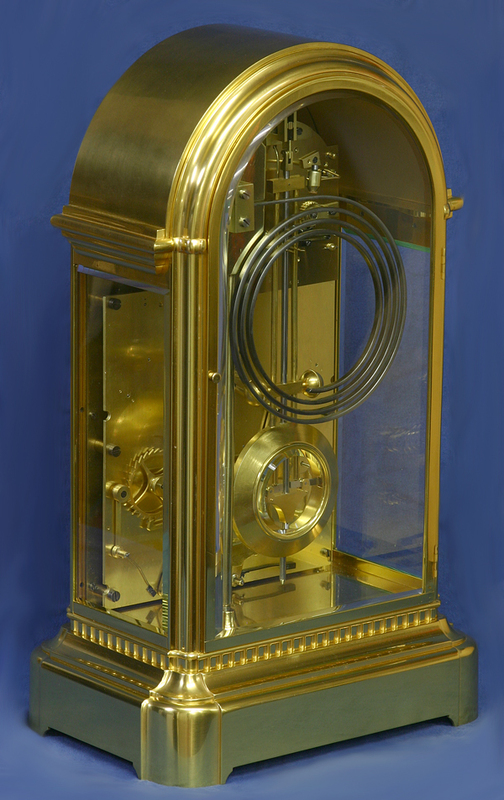 The large perpetual calendar mechanism is mounted below the clockwork, is set off the back plate and has a trip lever that is activated by the strikework. 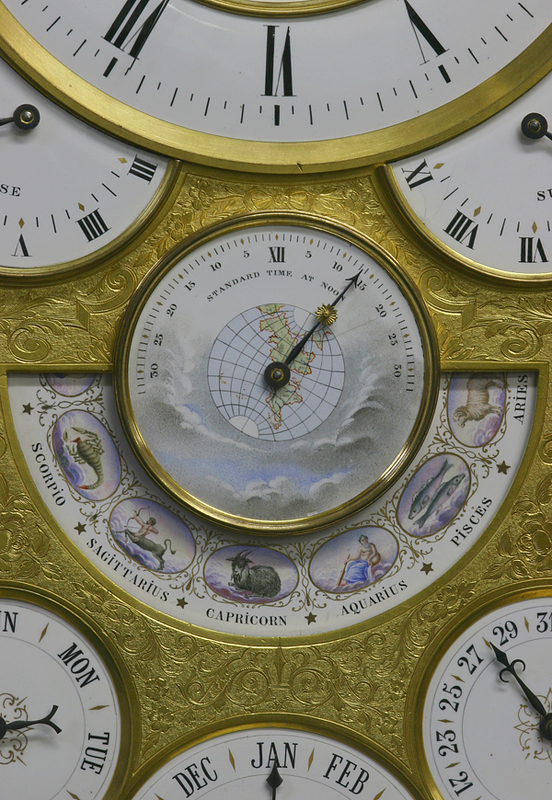 The complications include day, date, month, sunrise, sunset, moondial and equation of time. Louis-Achille Brocot, 1817-1878, was both a clockmaker and mathematician. 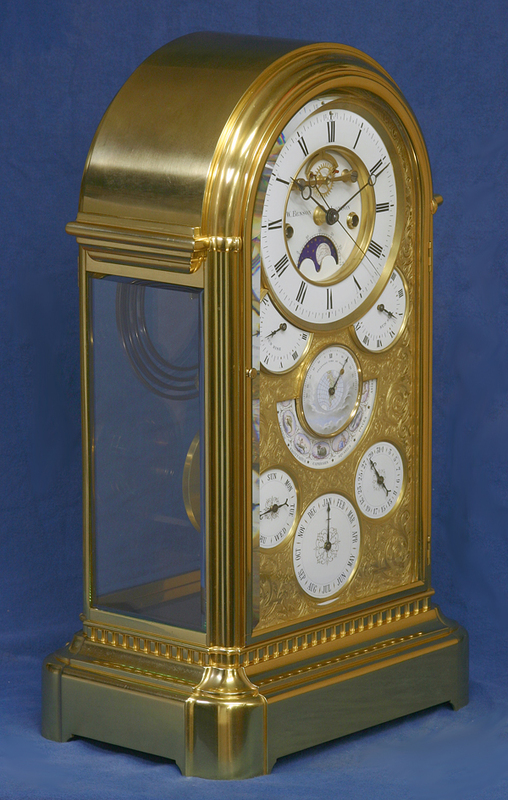 He was probably the most inventive of the five brothers fathered by the horologist Louis-Gabriel Brocot. He held numerous patents and went on to invent and improve many aspects of the mechanisms including the pendulum and suspension, escapement, calendar work and equation of time. The bimetallic grid-iron pendulum is a derivation of Ellicott’s pendulum and was patented by A. Brocot in 1847. Under the sunrise dial was a cardboard spacer cut from ephemera from the watch and chronometer maker Henry Aston of 22 Congress Street, Boston, MA. Aston is listed as working at that address c.1880. The eminent firm of JW Benson was in business from 1851-1897 and held numerous Royal warrants. 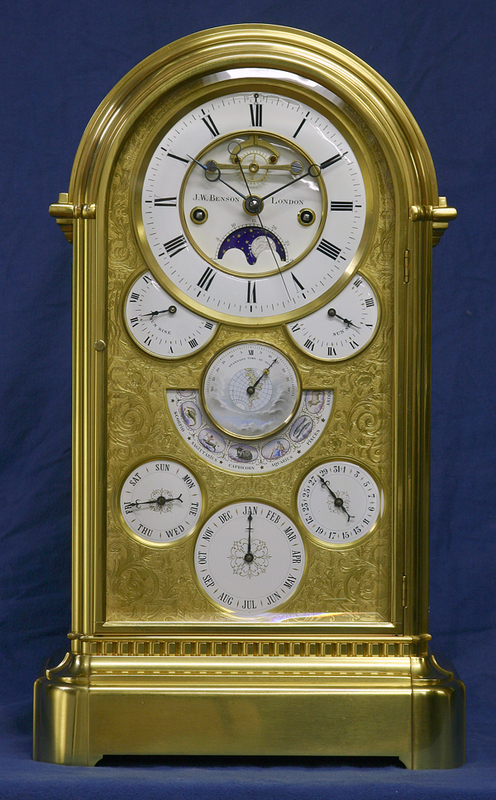 This is the largest and most complicated of the series of calendar clocks from Brocot.